How’s 2017 going so far? We’ve been spending our time wandering around, in the sunshine – it’s relentlessly sunny here in Tokyo, in a good way, except for the last two days of rain. The weather forecast is ridiculously accurate: if they predict rain at 2 pm, it’s pretty much guaranteed that you’ll need an umbrella at 2. If you’re ever in Tokyo, and it’s sunny but people are carrying umbrellas and all the combinis (convenience stores) roll out their racks of umbrellas, know that everyone else is in the know even if it looks like clear and sunny skies. Rain for the past two days meant that we spent some time indoors, checking out the traditional new years’ sales. Essentially everything is discounted, so it’s a great time to buy, if you’re looking. We found Mike a cute noragi jacket – a sort of padded kimono type jacket for only $30 and I’ve been jealous of it ever since because it’s so cold in our place. Whenever it’s cold, I tend to get really hungry, and to be honest, I’ve been getting a little bit squishy here. It’s hard not to because there’s so much good food! I’m totally susceptible to marketing and there are tonnes of large photos of food here – it seems like I’m constantly in a state of hunger. Take for example, our little neighborhood. We have cute artisanal places that don’t have photos, but we also have coffee chains that have giant banners. Anyway, the cheese looks melty and amazing and got Mike and I started on a discussion on how I think cheese is a big thing here and Mike thinks it isn’t. I feel like I see cheesy things all the time: cheese baum (cheesecake baked into a baumkuchen), cheesy ramen, cheesy curry, cheesy pancakes, cheesy everything! It’s funny though, because when you go to the grocery store, you’d expect to find a huge cheese selection, but you don’t. They have some imported New Zealand cheeses, but most of the cheese is shredded what looks to be mozzarella as well as their version of American cheese. They do have cheese from Hokkaido, which is very exciting, but at regular grocery stores all the cheese from Hokkaido seems to be cream cheese. Which explains the obsession with cheesecake, at least. I think we’re going to have to go on a deeper Japanese cheese dive, because cheese. Mike found this cute cheese stand, so maybe we’ll hit it up. In the meantime, to abate the need for cheese, I present you with EBM! 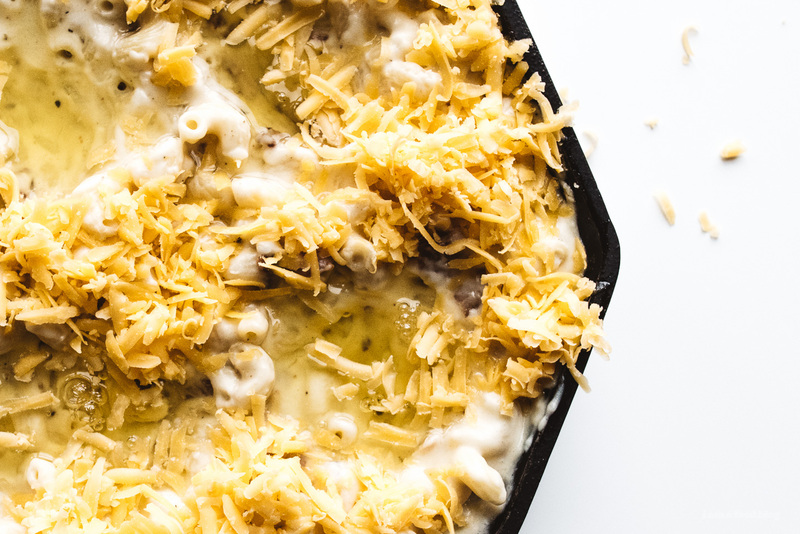 We made this bad boy back home, where there is cheese a plenty. 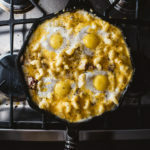 It’s basically an extra cheesy mac and cheese, with bacon bits thrown in and soft baked eggs on top for good measure. It creeps up on you like a good EDM track. 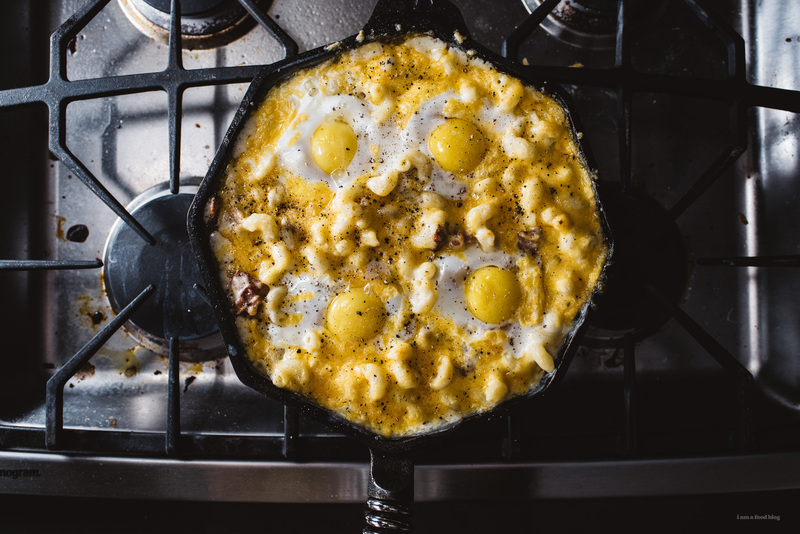 There’s the deep beat of the mac, the bass of the bacon, and the drop: the eggs on top. 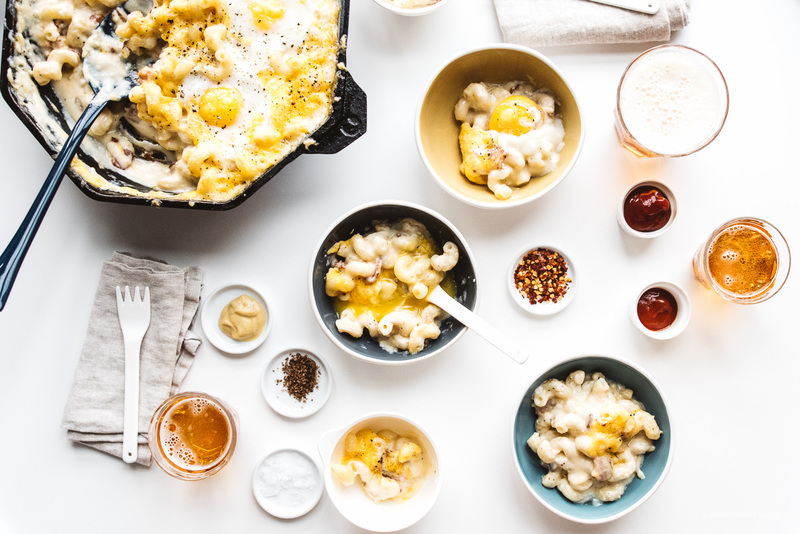 Breakfast and mac and cheese lovers unite! Fry the bacon until crispy, set aside. Boil your pasta until al dente, according the package. When it’s done, drain and set aside until your sauce is finished. Remove from the heat and add the salt and pepper, and cheese. Stir until cheese is melted. Add the drained pasta and bacon and and gently mix. Taste and adjust seasonings if needed. 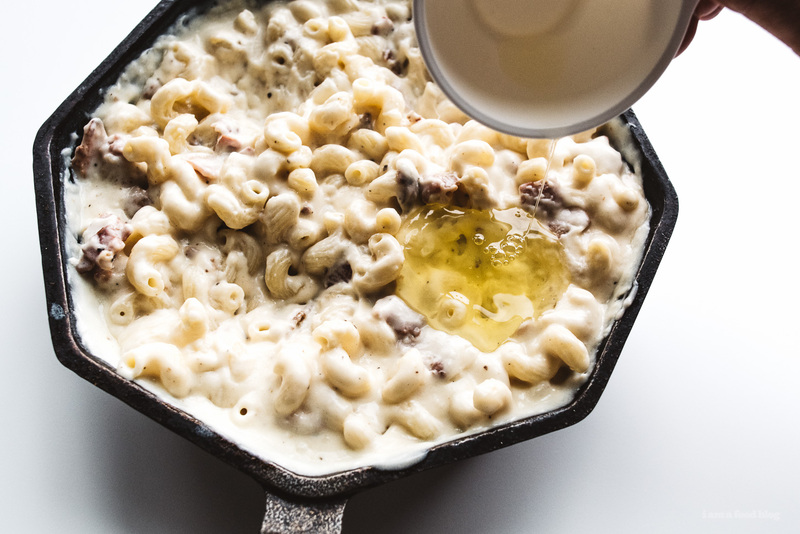 Place the mac and cheese in an oven-proof skillet. Make four small wells in the mac. Separate the egg whites from the yolks and pour the whites into the wells. This’ll ensure that the white are cooked while the yolks stay runny. Sprinkle cheese around the wells, if using. Bake until the whites are almost set, about 10 minutes. 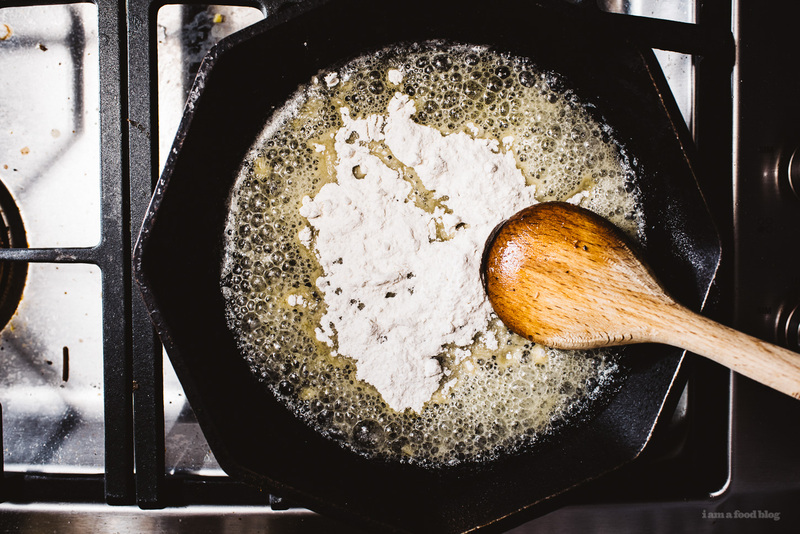 Top the whites with the yolks and bake until the yolks are just starting to set, 2-3 minutes. Remove from the oven and enjoy! best edm i’ve heard in a while (; i feel like koreans are more into cheese than japanese people (budae jiggae, and my friend’s mom used american cheese in her kimbap all the time), but that might be because i haven’t seen much cheesy japanese food in california. I saw this scroll down my FB timeline and I immediately had to share it. Since I started cooking on a regular basis, I’m constantly looking for delicious recipes to try and this one fits the bill exactly. Can’t wait to make this for myself and my daughter! My mouth is watering right now…LOL! Very nice. I have been missing your savory dishes looks like dinner for a rainy day. This looks very decadent. All that cheese and more! I was interested to read about your cheese observations in Japan. I never really associate cheese with Japan so it is news to me! 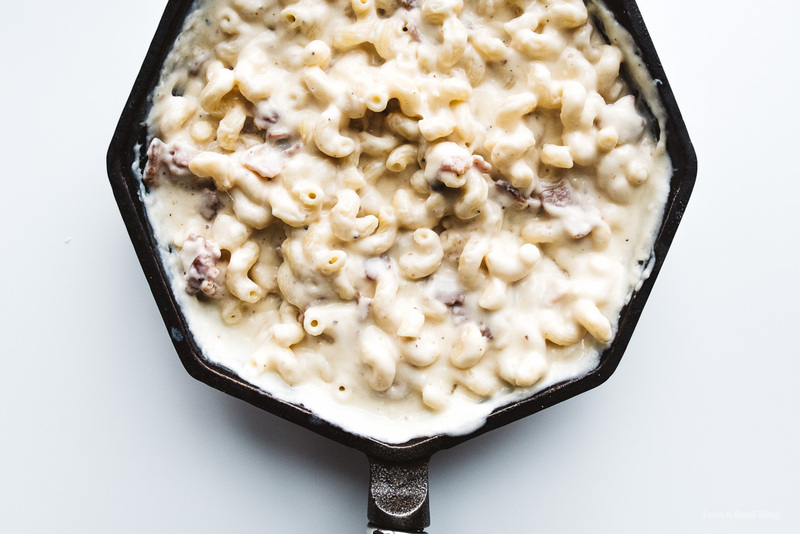 Everyone in our family love mac and cheese so I’m going to try this recipe. I’m bomping along to this EBM!!! I love many cheese and eggs, so i love it! Thank you to share the recipe. This was awesome! 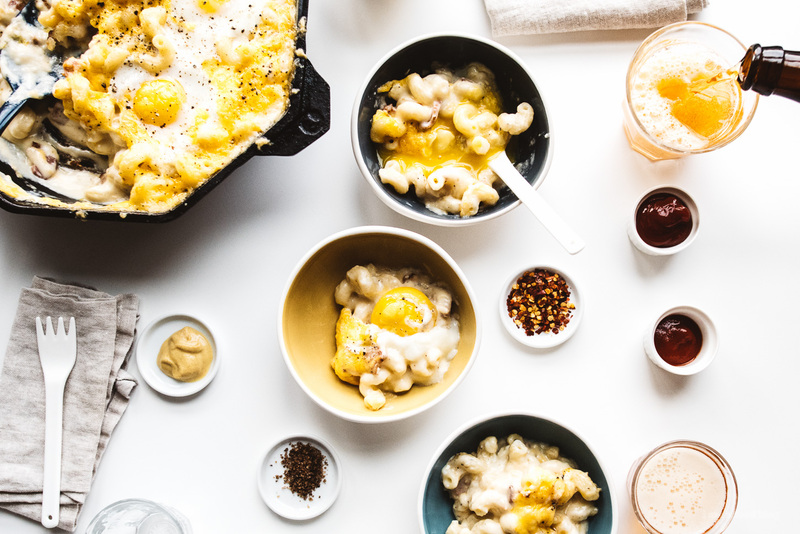 I had a leftover baked hamwith mac & cheese to use up……I just did the eggs as suggested so yolks would stay runny……delicious!!! EBM, EDM…what does this refer to?